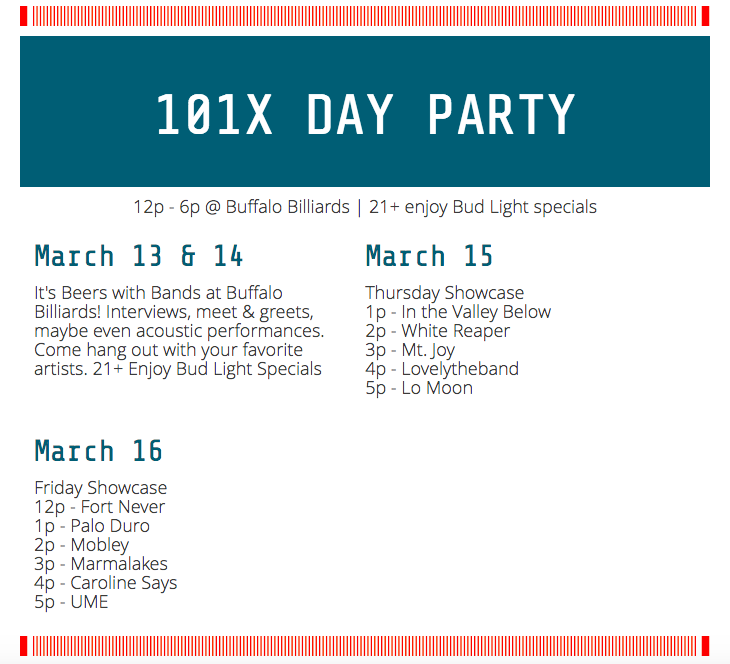 Local Austin radio station, 101X, is back at it again with another round of their jam-packed day parties, hosted at 6th Street venue, Buffalo Billiards. From Tuesday, March 13th through Friday, March 16th – that’s four full days, y’all! – we’ll be hobnobbing with some of our band favorites, sipping on ice cold Bud Lights, and rocking out at back-to-back shows! Kicking things off, the first two days of the event feature the aptly named and succinctly alliterated “Beers with Bands at Buffalo Billiards” featuring artist interviews, band meet-and-greets, and “maybe some surprise intimate acoustic performances,” according to the event’s organizers. We’re thinking that means, yes, definitely some surprise acoustic performances. I don’t know about y’all, but this native Austinite is particularly excited for the all-locals lineup on the last day of the event! Not only do I get to catch some of my favorite hometown loves in all their festival glory, I get to celebrate all that makes the Live Music Capital of the World one-of-a-kind alongside fellow Austinites and visitors alike. Join me, won’t you? Outside of that, I’m looking forward to rounding out my 2018 festival experience swaying to the soft stylings of songstress Caroline Says, chilling out to the lush beats of LA-based Lo Moon – who, in case you hadn’t heard, just dropped their first album after what felt like an eternity of teasing us with their standalone single, Loveless – and throwing it back with one of my all-time favorites, In The Valley Below. Anyone else up for an appropriately timed #TBT Peaches rendition?! While there’s no badge or RSVP required for this one, you can register for the chance for you and a friend to treat yo’ selves at the party “XIP” style – that’s 101X speak for “VIP” – with green room access on Thursday and Friday, “some beers” from Bud Light, and a pretty legit Bud Light SXSW guitar signed by all the artists taking part in the party. Oh, and you’ll also get the chance to hang with the 101X crew over the four-day shindig. Sounds like a pretty sweet deal to us for the low price of clicking a button and typing in your name and email address! Quick disclaimer: you do have to be 21+ to win, and also to attend any day of the party.